After you've set up your robot framework in RobotBuilder, you'll need to export the code and load it into VS Code. This article describes the process for doing so. Verity that the Export Directory points to where you want (1) and then click Java or C++ (2) to generate a VSCode project or update code. 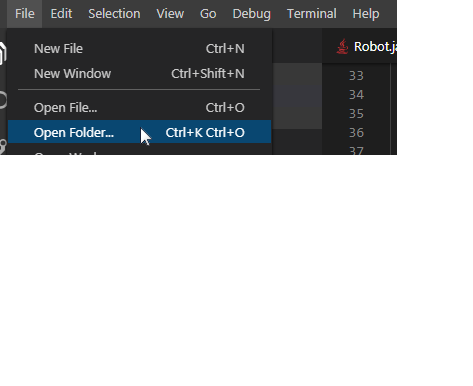 Open VS Code and select File -> Open Folder. Navigate to your Export location and click Select Folder.